Fall and the land yacht.... For those that may not remember, we named our rig SLOTH for Sailors Living On The Highway. Back in the motorhome after hauling our boat in the Chesapeake Bay and driving south from Hurricane Florence. 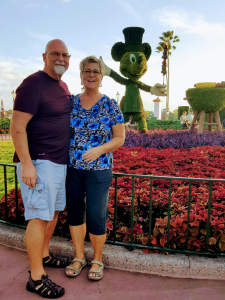 We wrapped up some appointments in Florida where we had the motorhome stored and started our trip. Epcot Food and Wine Festival was first. We were invited by friends we met at one of our regular campgrounds and it was a special treat. Lots of options for small plates and wine pairing, with a short concert by Starship. Just a very enjoyable day with perfect weather and good friends. Next stop was family in Tampa and a chance to spoil my granddaughters just a little bit more. One of the sad part of our nomadic life is time away from the grandkids. We also had wonderful visits with old sailing friends, then our usual stop in New Orleans as we headed west. 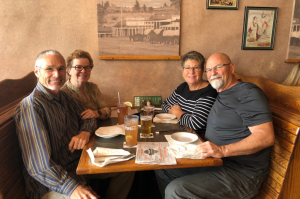 As soon as we hit Texas we rustled up some lunch with sea and land cruising buddies Chris and Barb. They winter near Houston and after several attempts we finally arranged a visit. The season plan was 2 months in Texas checking out several RV resorts to consider for a winter home. 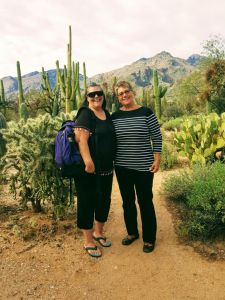 Then we would move on to visit the last few National Parks that we haven't been to yet in Arizona and California, along the way checking out more RV resorts and visiting friends. At the end of the season we would decide which area we would purchase a park model unit and become snow bird residents each winter. In Texas after touring several parks we found a wonderful community at Llano Grande that met all of our criteria, had fun people, and an 18 hole golf course. Weekly dances, nightly card games, shuffleboard, almost any craft or hobby, this park checked off every box on my spreadsheet and more. DeeO'gee enjoyed the dog park with a dog wash station! I even joined Steve on the course golfing in the two best ball scrambles each week. 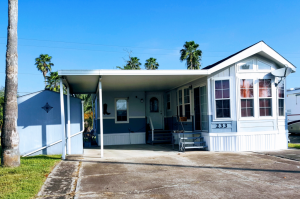 Now add that my grandson could join us from Austin for holidays and we decided to look at some housing options. We close on March 1st on a lovely park model and look forward to becoming an even bigger part of the Winter Texan community. After 2 months we said a temporary goodbye to friends and headed west again to complete our planned adventures. Arizona was great, what a beautiful state with so much to see and do. We visited 2 sets of sailing friends, a high school friend I hadn't seen in decades and my Milwaukee bestie in the Tuscan/Phoenix area. Doug and Meyka took us to Kartchner State Park for a hike and cavern tour. 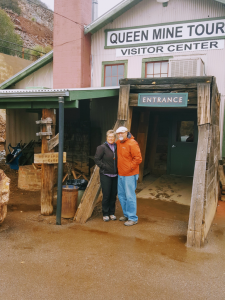 We enjoyed a day trip to the historic town of Bisbee and toured the mine there as well as stopping at Tombstone. Add food, wine and several games of Pegs and Jokers and you have a recipe for a great time. Kim was a gracious hostess and our tour guide for Tucson. One afternoon we spent a few hours taking in Sonora living desert museum. I never knew there were so many varieties of Cactus, now I want to plant a cactus garden! We then visited Saguaro National Park during the shutdown so the visitor center was closed but the road through the park was open. 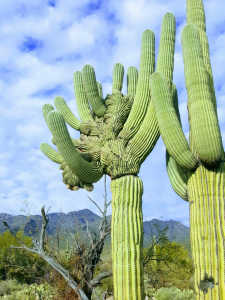 The entire area is populated with saguaro of every shape and size. It takes these magnificent succulents 75 long years of growing before they begin to sprout the arms and live to be over 150 years old. Hmmm, did i mention food, wine and several games of Pegs and Jokers? Moving north we visited with Kitty and Bill in their new winter home near Phoenix. This time we mixed things up a bit, food, margaritas and cards! I just don't want you to think we aren't flexible. Petrified Forest National Park was gated due to some vandalism so we will visit that one on our way back through to Texas. Hopefully that will be before the next government shutdown. A great car tour is on the scenic old Apache Trail stagecoach route. Stopping at several vistas and lunch in Tortilla Flats makes for another lovely day. artist community. Don't forget the food, wine and Pegs and Jokers each afternoon...are you seeing a pattern here? When it was time to move along we took a route that would let us visit Quartesite, all full timers head to check out this area eventually. This area has free and almost free desert camping on BLM land. 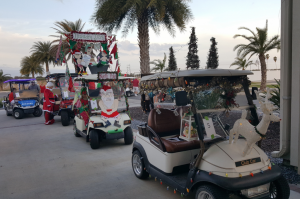 Many events take place over the winter that draws hundreds of RVers. Motorhome rallies, rock shows, swap meets, etc. 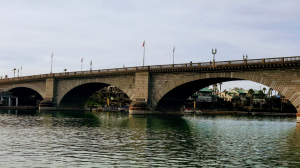 Our last stop before leaving the state was Lake Havasu. While summer is a better time to visit, we had lovely winter weather and enjoyed the sights. I'll have to put a summer visit on the bucket list. The fact that London Bridge is in the Arizona town just doesn't seem to make sense. The bridge was purchased from London in 1968 for over 2 million dollars, it took 3 years and another 4.5 million to transport and reassemble the bridge. It would be interesting to talk to the city father's to see if the bridge was worth the cost. We enjoyed Arizona so much that we are glad we have to pass through again to return to Texas.